This is the last, but not least, blog post from my travels around Europe! I had started my trip in Greece (How to Travel Vegan in Greece) then went to Italy (How to Travel Vegan in Italy) and then to Paris, France. My heart ached writing and re-watching my adventures in Paris. 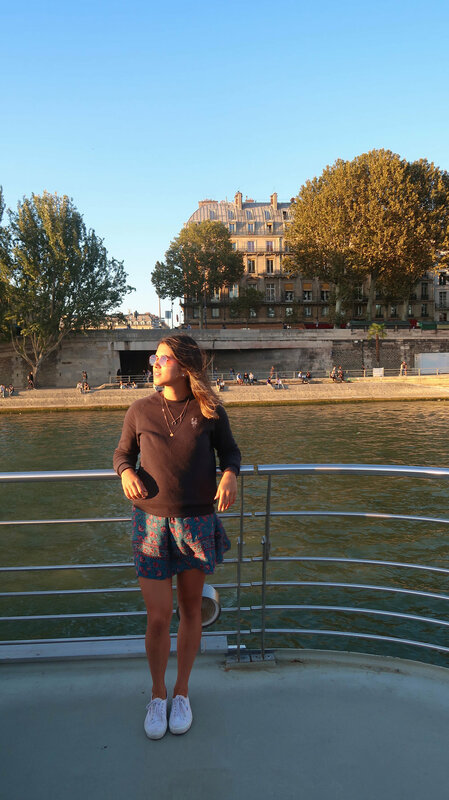 I spent five days in Paris and felt like it was a great amount of time. I definitely didn’t see everything because there is just so much and I know that I will be going back. 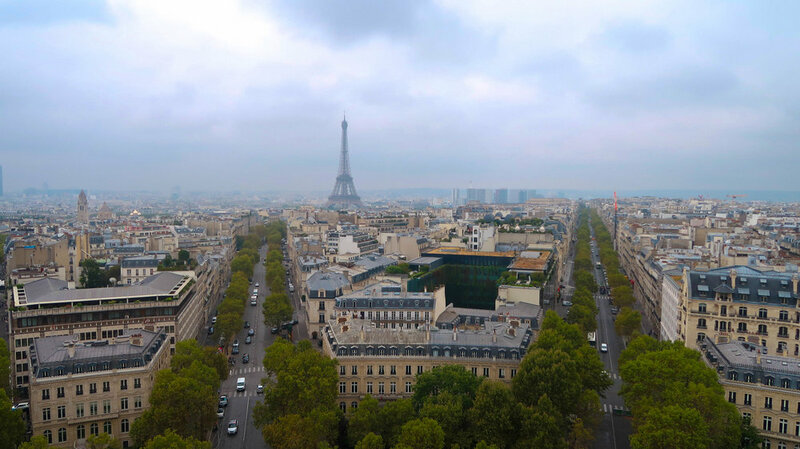 Keep reading to see my travel tips, itinerary, and how to travel vegan in Paris. I flew from Florence to Paris and when I arrived I felt a bit intimidated by the Paris metro but it’s pretty easy when you figure it out. You can buy tickets at each metro station and from the airport you can buy a pass that gets you all the way into the city. I would recommend always looking up your route ahead of time. When I arrived, I went straight to where I was staying, Generator Hostel, dropped off my bag and went on the hunt for food. I stopped at East Side Burgers, the first vegetarian fast food spot in Paris. Every burger there can be made vegan, it was perfect after a morning of travelling, the cheese they used was amazing. Thanks to the Happy Cow App, I saw there was a vegan bakery nearby. I walked to Pâtisserie Végétale and I think I died and went to heaven. I couldn’t believe that every single thing was vegan. They had the most beautiful desserts I have ever seen AND they had vegan croissants. I fell in love with this place. I was so in love that I ended up going every day of my trip (except for one because they are closed on Mondays). I said this about every place I visited but eating vegan in Paris was so easy! If you didn’t read about it in my Italy post, I definitely recommend purchasing the Happy Cow App to easily find vegan options based on your location. I saw that the electric scooter company Bird was in Paris so I rented a scooter and rode down to Notre-Dame Cathedral. If you decide to ride the scooters be very careful because the drivers can be quite aggressive. The Cathedral was amazing to see, it was creepy and beautiful at the same time. I still can’t get over how detailed and intricate the designs on the old cathedrals are. I hadn’t planned my day around going to Notre-Dame so I didn’t end up going inside because the line was quite long. I was trying to find things to do that were quick and close by, I still had to check in and I didn’t want to travel too far from the hostel that day. 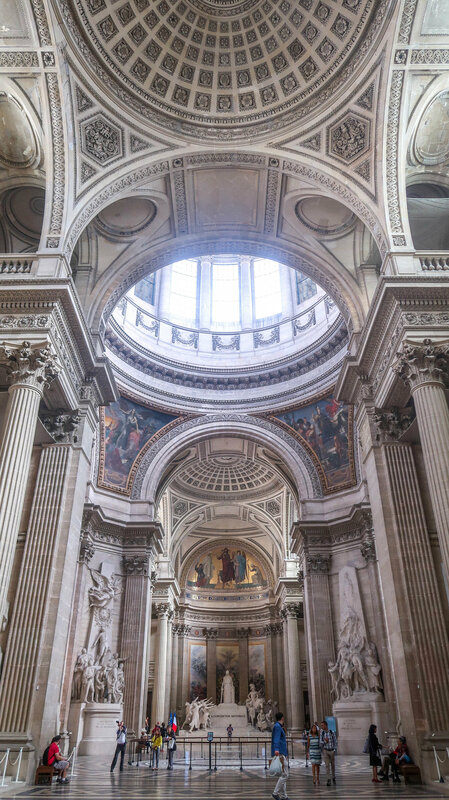 I found that the Catacombs of Paris were close by and on my way there I walked past the Pantheon. I went inside because I brought my student card so my entry was free. 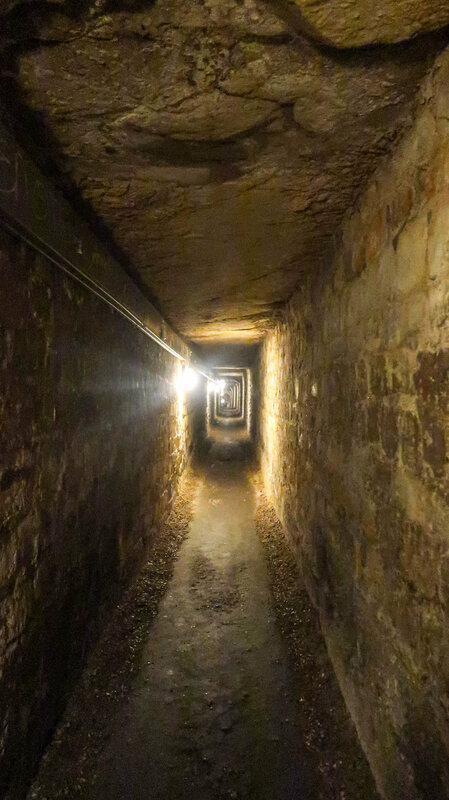 It was a great place to visit, I wouldn’t say it is a must-do but they had a huge crypt with Voltaire, Rousseau, and other interesting people. Then I walked through Rue Mouffetard, one of the oldest streets in Paris. It was lined with cute stores and I found a vegan spot called Vegan Folies that had a lot of yummy looking food. Finally, I was at the Catacombs. It said the best time to go was later in the day but there was still quite a long line when I got there. I would recommend purchasing skip-the-line tickets to any attraction you want to see. 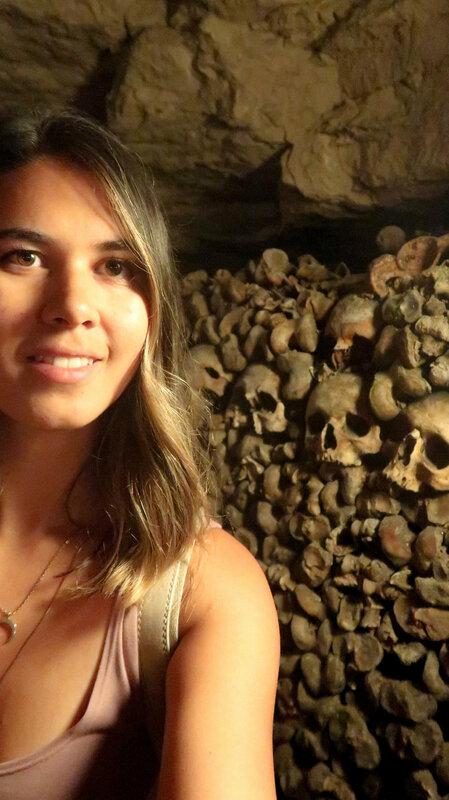 If you don’t know what the Paris Catacombs are, it’s an underground ossuary containing over six million bodies from the 1800’s. Yikes. It had a very eerie feeling, it was also damp and had a weird smell. If you are claustrophobic at all I would not recommend it. It didn’t take long to go through the whole thing but it’s not a place you want to spend a lot of time. I ended up walking through a large part by myself because the people up ahead were very fast and they didn’t let anyone in directly behind me. I was only a little bit freaked out...but it was really cool to see! That night I had a late dinner at Bodhi Vegan, an asian restaurant with a really big and inexpensive menu. The next day started out a bit rainy. I took the metro to the Arc de Triomphe, a huge monument in the middle of the craziest roundabout. There is a tunnel to get to the Arc, do not run across! I didn’t know you could go to the top of the Arc (I obviously didn’t do a lot of research on this before I went) and I got there before it opened so I was one of the first in line. You have to climb quite a lot of stairs to get to the top but it was definitely worth it. The views were some of the best even though it was a bit cloudy and rainy when I went. Next, I walked down the famous Avenue des Champs-Élysées which has been called the most beautiful avenue in Paris. Every store on this street is luxurious and they have everything from Levis to Gucci. Even the Sephora had a huge red carpet going through the store. You could spend all day walking up and down this street. Avenue des Champs-Élysées connects right to Place de la Concorde which is the largest publc square in France. There is a huge garden with lots of statues and water fountains, it’s a cute place to sit and relax. This might be a weird tip but I wouldn’t recommend flip flops through here because whatever they use on the ground gets in your shoes and kicks up really easily. It was quite annoying. You can walk right through Place de la Concorde to Musée du Louvre. I knew the Louvre is always busy so I had done a lot of research on the best time to go, the different entrances, which one is better than the other, etc. But when I got there, in the middle of the day, there was no line at all. I was very confused. I thought it would be a great day to be inside because it was rainy and had expected it to be packed. I talked to someone about it later and they said there are no lines on rainy days because no one wants to wait outside in the rain. It worked out well for me! Musée du Louvre was bigger than I could have ever imagined. I visited one exhibition, a whole floor, and was already so tired because I had walked so much already that day. I decided to scope out Mona Lisa and then leave. It was exciting to see and I wasn’t disappointed by the size because everyone talks about how it’s much smaller than they thought. I will definitely go back and explore the museum more! After all that walking I went back to Pâtisserie Végétale for my first-ever vegan eclair. It was magical. The next day I went to explore the district Le Marais. This was my favourite district in Paris, I ended up going back again on another day. Every store was so unique and had some of the most amazing jewellery and bags I have ever seen. Unfortunately, I wasn’t allowed to take a photo in these stores. I also loved the overall vibe and feel of Le Marais, it’s hard to describe, it felt like a hidden gem in Paris. It wasn’t busy but there was so much to look at. 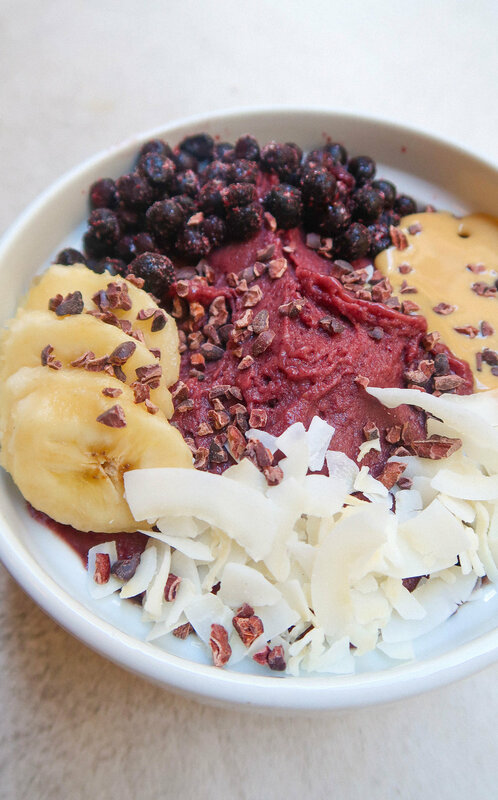 I went to a smoothie bowl shop called Love Juice which was so small and hard to find, but worth it. 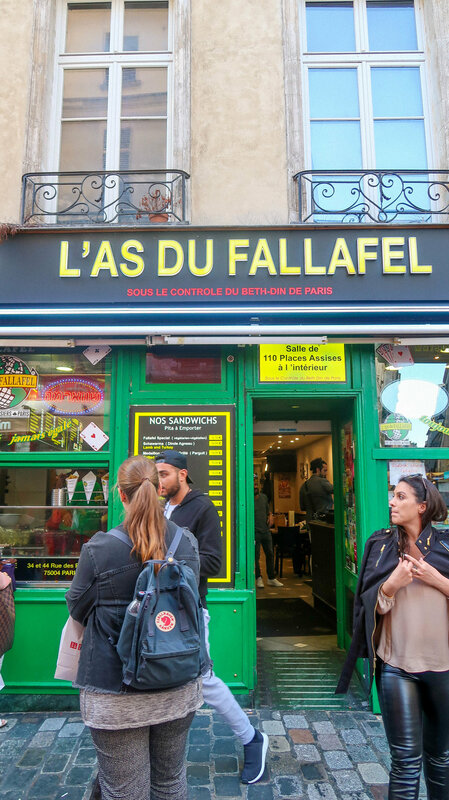 I also went to a highly recommended falafel place, L’as Du Fallafel. The bread alone was insanely good and I’ve never had anything like it! Look at that wrap! I’m drooling just thinking about it. 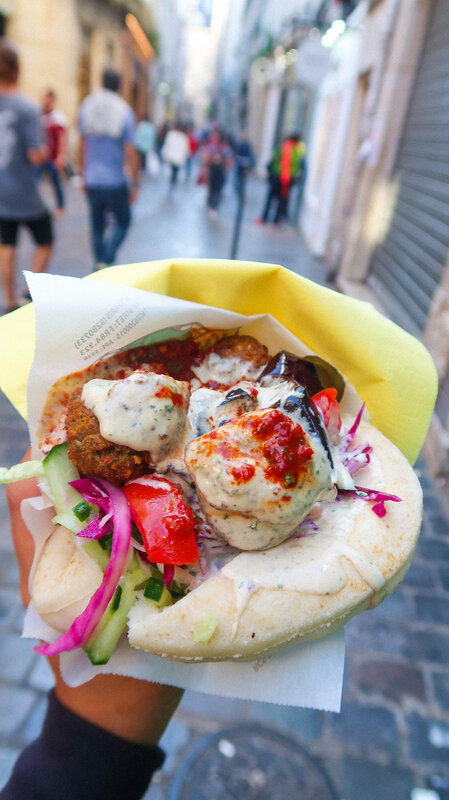 It seemed that in Paris you can find any kind of food you’re looking for and it’s probably going to be amazing. Later that night, I went on Bateaux Mouches. It’s a large boat that takes you up and down the Seine river with commentary telling you about all the landmarks along the way. Someone gave me the advice to go at sunset and I’m so glad I did! It was beautiful and just a little chilly. I recommend pre-purchasing a ticket online and showing up about 20 minutes before the hour. After seeing it from a distance each day before this, I finally went to see the Eiffel Tower. It’s such a huge and beautiful structure and so impressive. I got off the metro at Trocadéro station where you see Palais de Chaillot, a large museum. If you walk down the stairs you get to a park with huge water fountains and an amazing view of the tower. The sun was very high in the sky when I went so it was hard to get a good photo from the park so I would recommend going earlier in the morning or early evening. I walked over to the tower so I could see it up close but didn’t go up. Then I went to see Montmartre, the artistic district where Picasso and Monet used to work and hang out. There is a square filled with very talented artists doing caricatures and selling some beautiful paintings. I wish that I could have taken a lot of them home. Montmartre is at the top of a hill so make sure you’re ready to walk (but you should be ready to walk every single day you’re in Paris anyway). At the top of the hill is Sacré-Coeur, a beautiful church and there’s a great view of Paris from here as well. Next, I went to Wild and the Moon which is a fully vegan smoothie and juice bar with food as well. The smoothie I had was potentially the best smoothie I’ve ever had in my life. 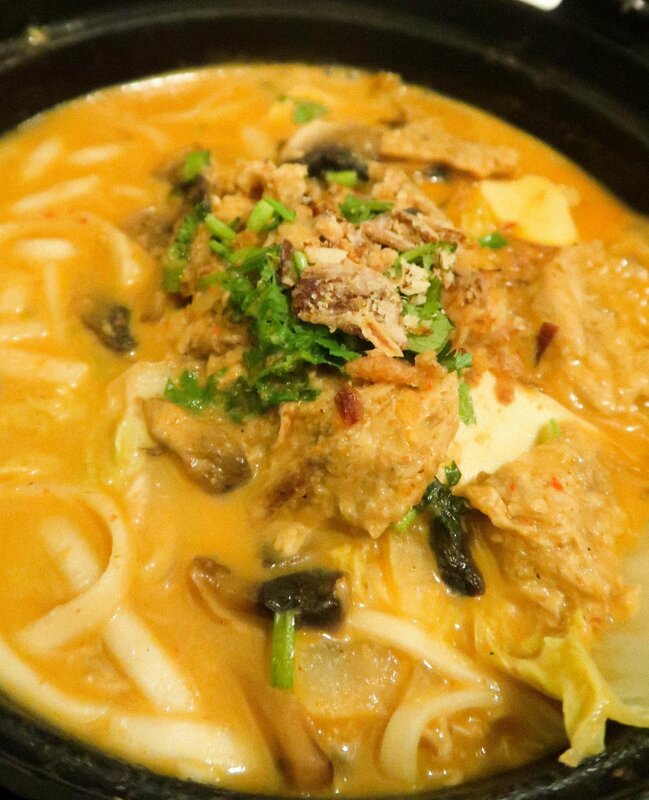 The taste and the consistency and all the ingredients were so perfect. Warning, this place is not cheap. The owners of Veja, an ethical and sustainable shoe company have a store called Centre Commerical. I made my way there and stopped at a lot of cute stores along the way. The store is all ethical and sustainable brands but they didn’t have a very big womens section. On the way back to the hostel I stopped at the grocery store that was next door and found so many vegan options everywhere. You might notice a lot of things saying “bio” or biological which means it’s organic. I loved walking the streets of Paris, the architecture and bridges and everything was so beautiful and every cafe I passed I wanted to stop at. I had two more days left in Paris. I visited Rue Cremieux, a street in Paris with colourful homes with a style that is more similar to London. It is the perfect place to get some Instagram-worthy photos. It’s not a very well known spot but enough so that a lot of people have signs in their windows saying no photos or videos. After taking photos I tried to find a place to eat and found that a lot of places are closed on Sunday. I checked out Confiture Parisienne, a cute restaurant and store selling their own jams. I had a delicious gazpacho which wasn’t listed as vegan but when I asked they confirmed that it was. After lunch I went to Pont de Bir-Hakeim, the bridge you might recognize from the movie Inception. It’s a great photo spot and has a nice view of the Eiffel Tower. For dinner, I ate at Hank Pizza, an all-vegan pizza shop from the same owners of Hank Burger, which I didn’t get the chance to visit. At night, I went with a friend to have a drink on the patio at Palais de Tokyo and then we walked over (with beer) to the nearest bridge with barely any one on it and it was the perfect place to watch the tower sparkle. Then we walked over to the tower and sat in the park and watched it sparkle some more! On my last day, we went to the Ballon de Paris. It’s a big air balloon that is tethered to the ground and takes you up 300m to see some of the best views of Paris. We went on a weekday and it wasn’t busy at all. It was pretty inexpensive so I would highly recommend it! My last “meal” in Paris was a chocolate peanut butter piece of cake from the vegan cafe, Cloud Cakes. 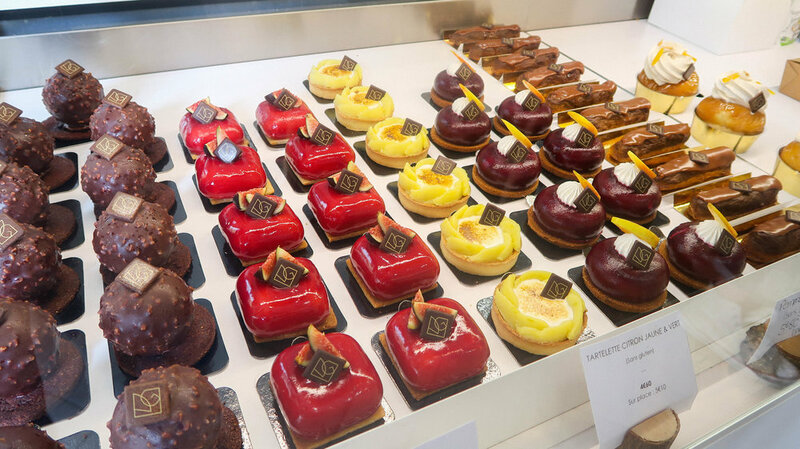 The cake was really good but I preferred the selection and quality of treats at Pâtisserie Végétale. Then I made my way to the airport and my Paris adventures were over…for now. I relied heavily on my phone to navigate Paris so here’s a tip I didn’t put in my other blog posts: If you have an unlocked cell phone you can purchase a sim card with data when you arrive, for a pretty good price, so you can use your phone without expensive roaming fees. My last tip: learn some French before you arrive. They do not like to speak English but are more willing if you try to speak French first.